With a lot of cities starting to ban plastic bags it’s time to start making your own. The ones I use for groceries are great, but they are pretty bulky for carrying around with you. Here is a nice design from More Style Than Cash that roll up so you can stash one in your purse or backpack and have a couple in the car. A few weeks ago I showed a quilt made from jelly rolls, now I have a video for you to watch on another jelly roll quilt. It is called the jelly roll race, you should be able to finish a quilt top in about an hour. 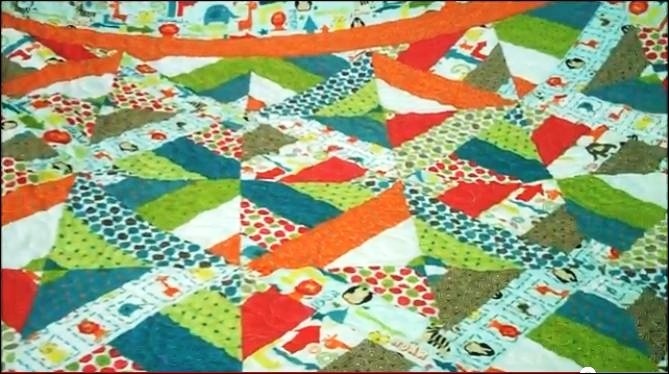 This is a YouTube video from Missouri Quilt Company. I thought these beaded sun catchers (for lack of a better name) were very pretty. 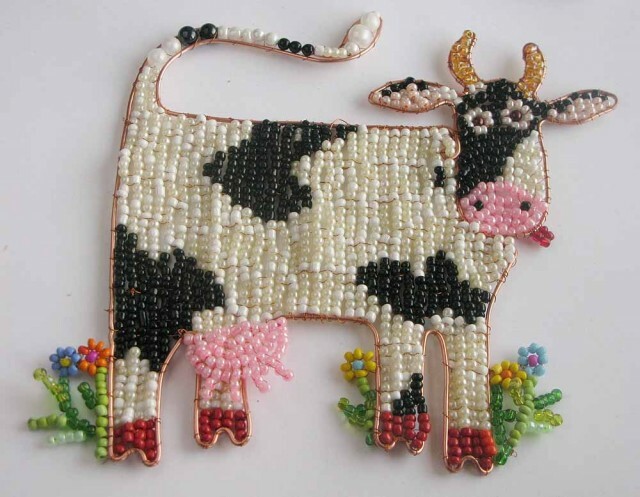 The original blog for this is in Russian, but Google translated it enough to follow the directions and there are great pictures to follow for the beaded cow. I am going to give the hearts a try as that is what spoke to me. 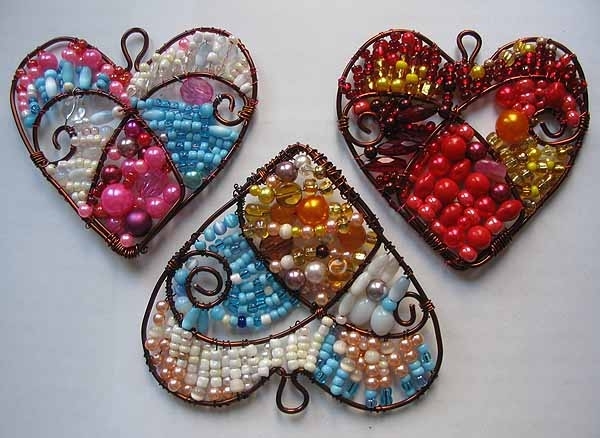 Nice way to use up some of my beads. For some reason today I am missing Alaska. 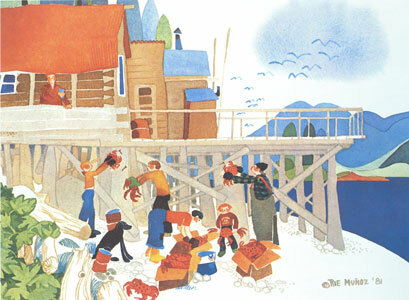 My husband and I lived in Eagle River for about eight years. If you have been following this blog for a while you may know I use to earn my living by picture framing. The great thing about this is I got to meet some wonderful artist along the way. Here are five I enjoy and hope you do to. I hope if you haven’t been to Alaska that someday you get a chance to visit. It is truly a beautiful place. I love the colors and people she paints, so full of life. You can just see how much fun her characters are having in her artwork. 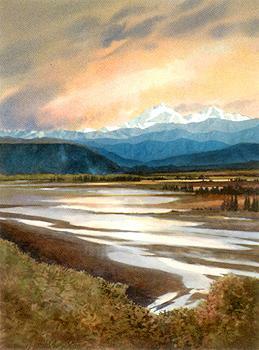 His pictures have a way of taking me to the places he paints. Sea otters are my favorite Alaskan animals. 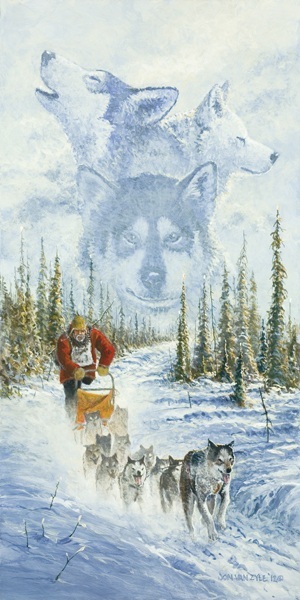 Ed Tussey does a wonderful job of painting them and he can make water sparkle in his paintings. It amazes me. 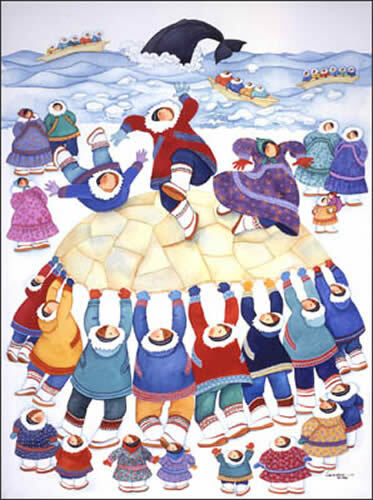 There is something about the way Nancy Taylor Stonington can let the light shine through her work. 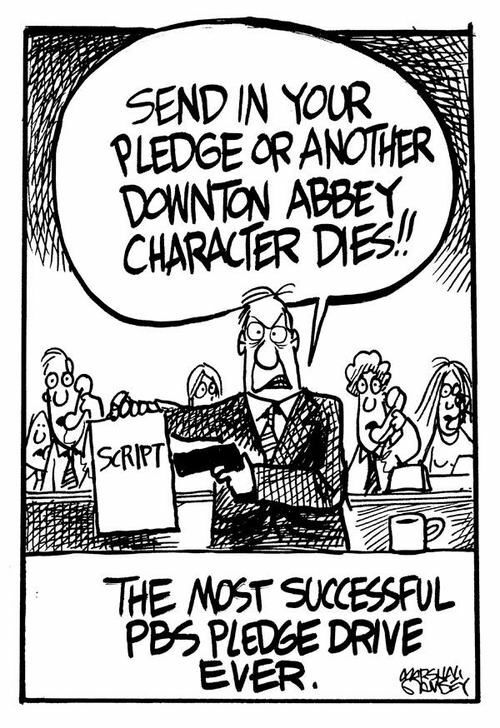 I love watching Downton Abbey, hate waiting for the next season to come. If you are a fan you just might like this memo board made to look like a butler’s bell. This cute idea came from Atta Girl Says. So gather your supplies together and invite the girls over for tea and start crafting. And I thought this was funny so I am sharing. I have a great quilt video for you guys to check out! I have never bought a jelly roll before, but now I have to make a trip to the fabric store. (Oh, darn) This quilt looks so easy and most of the cutting is done for you. So check out the YouTube video from the Missouri Quilt Co. and 3 Dudes. 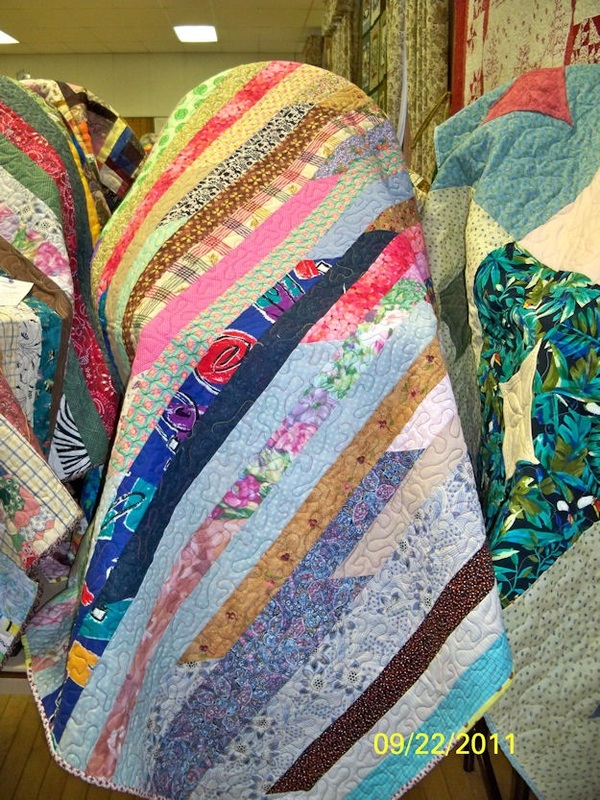 Missouri Quilt Co. has videos on quilting for everyone to see on YouTube. I like the glow of the colored glass on these pretty fishbowl lanterns. 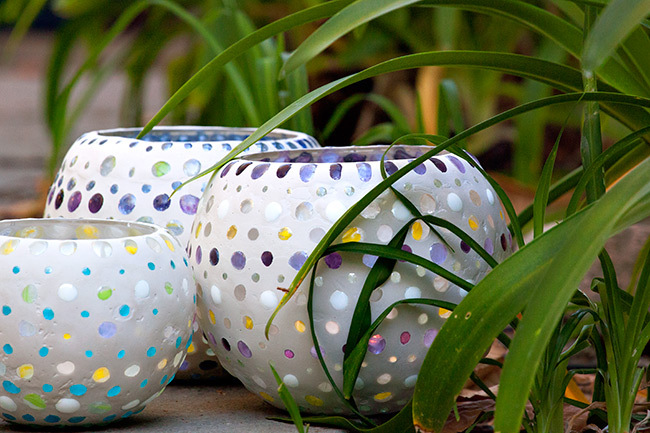 Artistic Junk shows you just what to do to make these wonderful lanterns. I would trust the E-6000 glue over the hot glue gun, but the rest should go pretty smooth. You can sometimes get lucky and find the glass stones at the dollar store. The plaster of paris gives you a smooth look, but you could also use grout mix (the kind you use for tiling) Might have a little rougher look, but easier to work back off the glass stones. My husband and I have such a hard time losing weight. We have tried many different diets, life style changes, weight loss drinks etc but find ourselves falling back to our old eating habits. So while brain storming last night we came up with an idea. We each wrote down 10 dinners meals that we enjoy, along with a list of breakfast, lunch and snacks. Now my task is to take that list and find a way to make them healthy and low-fat. I think it will work because we are still eating things we crave and like, just made them better for us. I am sure I will have to tweak the recipes a few times to get the right mix, but I am up for that. Thought if I put this in writing and sent it out there to the world it would help keep me in line. Wish us luck and if you have any ideas you like to share I would be happy to hear from you.